There is no love more sincere than the love of food. One large onion, chopped or two or three Tbs. of minced dried onions, rehydrated in water to cover. One can chopped green chilies--4 oz.--I buy the whole ones and chop them myself as I've had a few cans of "chopped" that were green chili "soup"
1 can olives, cut in half--6 oz. 2 cans tomato paste--6 oz. Make the enchiladas sauce using seasoning mix, tomato paste and water. Simmer for 15 minutes. Spray a 9x13 inch baking dish with vegetable spray. Put 1 1/4 cup sauce in the bottom of the pan, Tear seven tortillas into pieces and cover bottom of the pan with them. Mix onion, green chili's, olives, cheese and eggs. Layer on top of tortillas. Top with a layer of sauce, about 1 1/2 cup/ Tear remaining tortillas and put on top of filling. Cover with sauce. You will have sauce leftover--just throw it away. Bake in 350 degree oven about 1/2 hour or until hot. 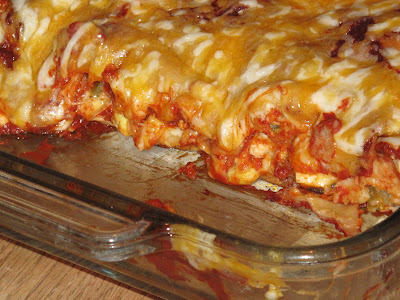 Cover with a good layer of shredded cheese and bake about three minutes more. 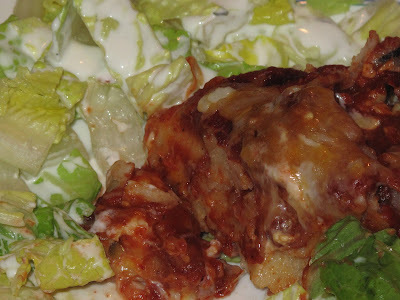 Serve over salad, dressed with Ranch dressing or you favorite dressing. I loved these but Phil says they are not his favorite. His favorite? Green enchiladas. Oops, I see that recipe isn't here yet. I'll add it one of these days. PS Buy the pkgs. of enchiladas seasoning mix on sale for 3/$1.oo and the tomato paste for the same price, then when you want to make enchiladas you will be ready. I'd much rather shop in my basement than at the store. BARBEQUE SAUCE--A must have for so many things. Wonderful on hot dogs. BLACK BEAN SOUP--A simple little soup, very tasty. BREAKFAST BARS--These are wonderful and for some reason seem to be a diet food. Everytime I eat them it seems I have lost weight the next day. CATALINA SALAD DRESSING--We have this in the fridge at all times. CHERRY CREAM CHEESE PIE--Easiest dessert and the best. CHICKEN WITH DUCK SAUCE--Kraut's faovorite. I love it too. CHOCOLATE CHIP-TOFFEE BITS-OATMEAL COOKIES--The BEST chocolate chip cookie. CINDY CROOKSTON’S FABULOUS SPAGHETTI SAUCE--A wonderful crock pot recipe. I use the leftovers from this for Pizza Penne. EASIEST WHOLE WHEAT BREAD--Truly a wonderful bread. KALE AND BEAN SOUP--This is probably the most used recipe in my whole collection. I make HUGE pots of it in the fall when the kale is ready and then freeze it in quart zip-freezer bags. It makes a nice lunch and I always have some on hand to take to someone who is ill.
KNOR SPINACH DIP--Everyone has this recipe and that's because it's the best. MUSHROOM ASPARAGUS LASAGNA--A favorite springtime recipe. PARMESAN ROLLS--This is another favorite of mine. A local restaurant, Magleby's, serve these before you have even ordered and are they are much loved. PIZZA PENNE PASTA--This is one of the few leftovers that I will eat. In fact I hope no one else will want to eat it as I love it and will eat it every day for days on end. I make a double batch of this so I have some to give away. POPCORN WITH BROWNED BUTTER--Don't make microwave popcorn, do it this way. You won't be sorry. POPPY SEED SALAD DRESSING--I am not allowed to go to pot lucks without this! RUSSIAN TEACAKES--It wouldn't be Christmas without these. SPICY SPAGHETTI SAUCE--Make it one day and then use the leftovers to make Pizza Penne or Lasagna. STUFFED POTATOES--This is a favorite of mine and of Her Excellency of Mousehole. They are good warmed up the next day--or the next--so I always make extra. SUMMER PASTA--The BEST pasta ever. SUNBURGERS--When we were vegan I made these and froze them so we always had something to eat. THICK WATER--If you want to make salad dressings lower fat this is a must. YOGURT--A MUST make in the spring when the strawberries are in season. Hungry people looking for good things to eat.